We got this postcard last week. Of course we went. It said "free." 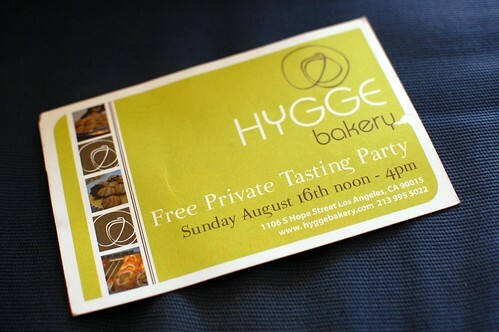 According to the other side of the postcard, Hygge Bakery is "the only fully authentic Danish bakery in all of Los Angeles" and a "20-year dream brought to life by owner Rasmus Lee." 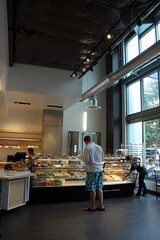 The card further touts, "All bread and pastries are baked fresh daily by Henrik Gram, expert celebrity baker from Denmark." In case you're wondering, it's pronounced "hoo-geh." Yeah, we wouldn't have guessed that either. But it's downtown! Lucky us! 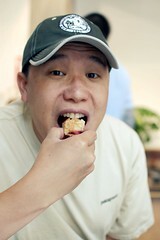 I loved the place before I even took a bite. A modern loft gets me every time. 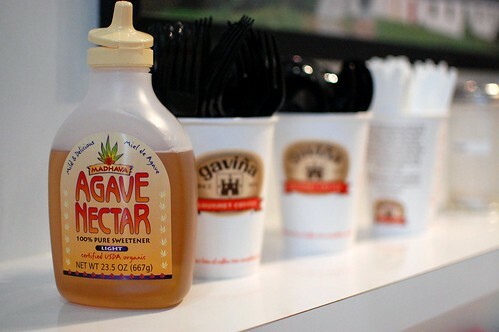 And I knew I was in for quality goods when I spied a bottle of agave nectar amidst the coffee and tea accoutrements. 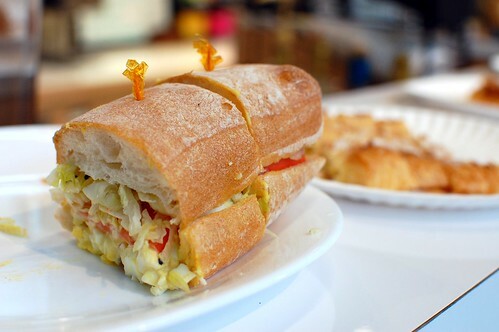 We were surrounded by sandwiches and pastries. All free. All for the taking. 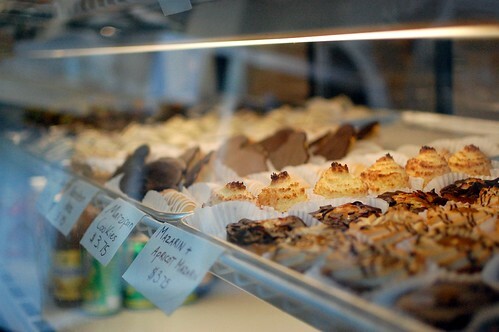 If we didn't see what we wanted already on a plate, all we had to do was go to the glass display, point, and ask. 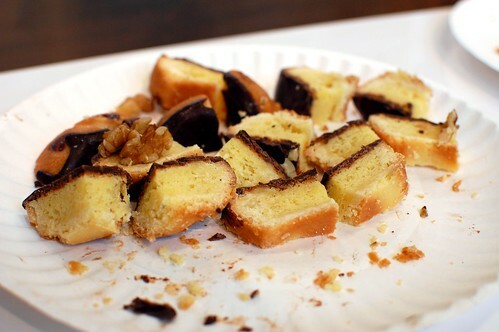 Magically, every baked good we desired was cut up into bite-sized pieces for us to enjoy. Every single thing we tried was delicious. We were really impressed. I was particularly happy because things weren't too sweet. I hope all these other people were happy, too, because I'd really like Hygge to stick around. In unrelated news, I'm glad this guy has stuck around. As of Wednesday, we will have been married for three years. 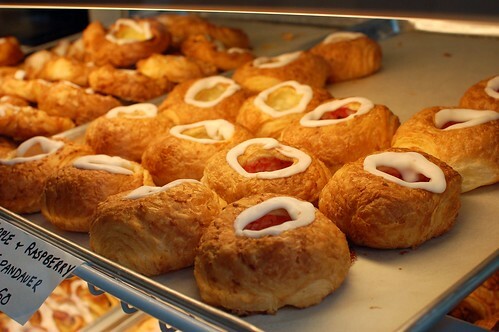 We bought a couple pastries to take home. Yes, even after eating 50 billion of them for free -- a true testament to how good they were. A fresh and wondrous little piece of heaven. The best thing we had that day. 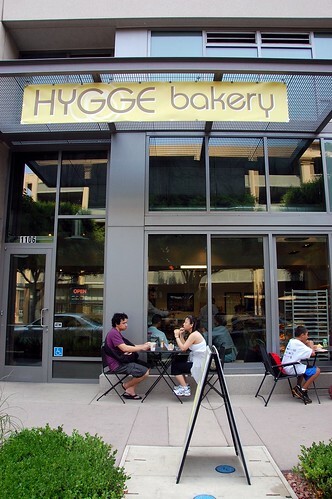 Please go to Hygge, so I can continue having a great neighborhood bakery. It will be worth your time. Mange tak! 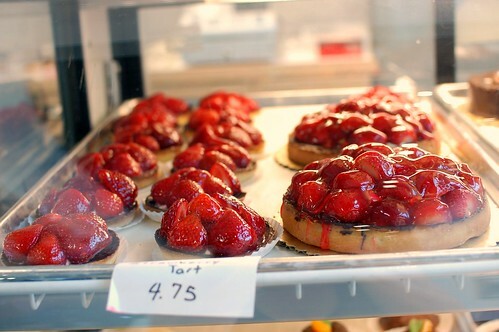 Hmmmm that strawberry tart looks amazing. Yum. You know, I'm all about supporting the little shops too. 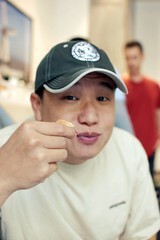 I like that you bought something even though they let you taste a bunch for free. Also, hooray for wedding date twins! Yum. 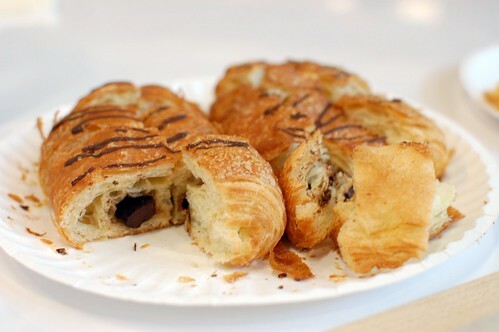 Pastries are my weakness. 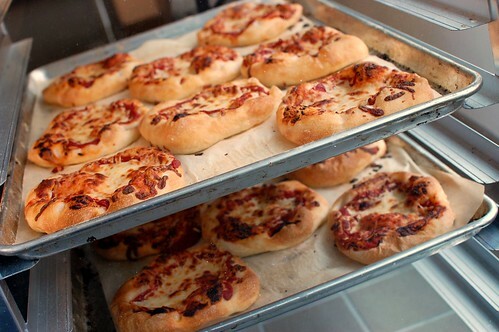 Well, carbs in general are my weakness. Yummy! 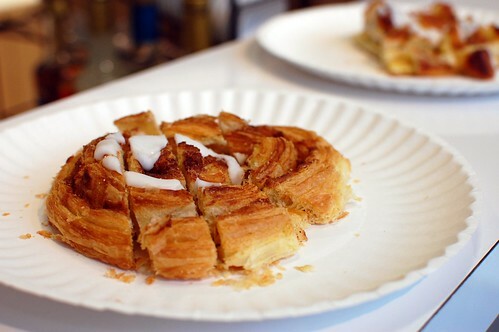 The cinnamon roll looks delish!!!!! D says she supports the little guy while she shops at walmart? I think not. free is always welcome, especially if it's good! This post was cruel. 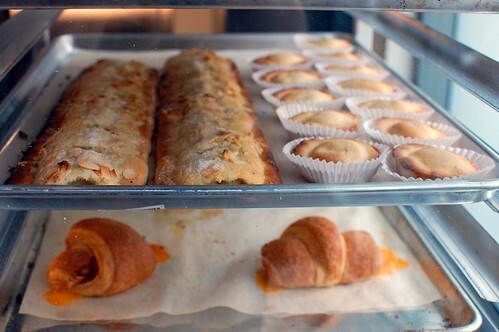 I want to eat all of those things, and I think the only approximation I can find in Santiago would be a pain au chocolat! 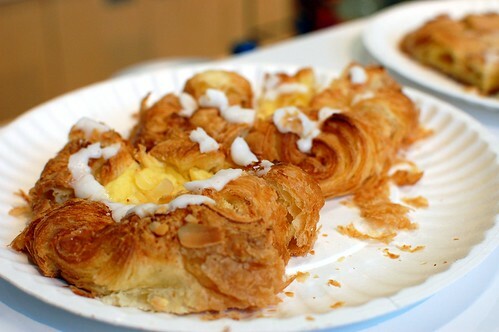 No yummy danish pastries or sandwiches around here. 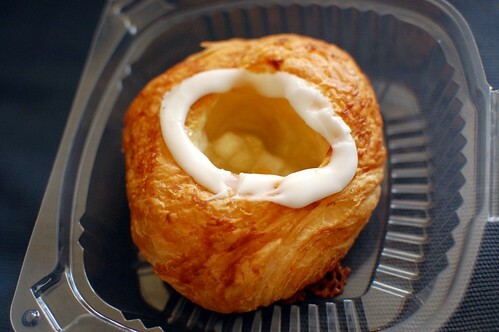 It looks delish. And happy anniversary! Knowing you, I'm already looking forward to photos of some amazing celebratory dinner. Oh yeah, and Happy Anniversary!! yummmmm! 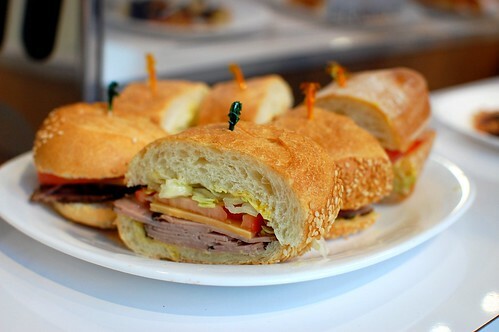 everything looks delish. how was the kringle? i heart kringle so much. Shut the front door! 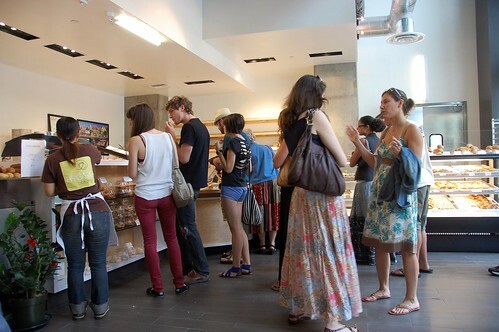 You went to a place that had fresh baked goods and you could eat all of it for FREE?!? I imagine that is what heaven will be like. 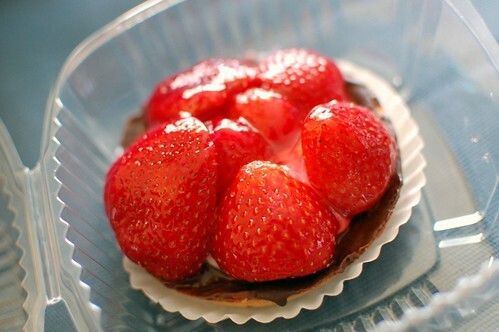 i want strawberry tart. maybe it'll be my "break" during school. Happy Anniversary Po & Rivers! I'm glad to see Hygee finally open to the public. It's been years in the making. that's cool! yay for neighborhood stores! Happy Anniversary Monkeys! 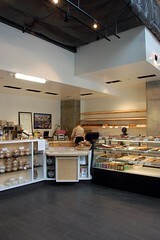 That bakery looks awesome! 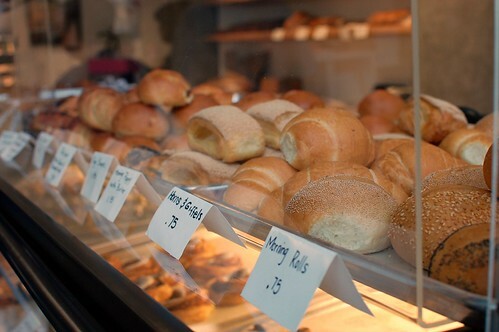 I long for the day such a bakery opens in BFE. Looks like I'll need to make a stop downtown next time I'm in LA. 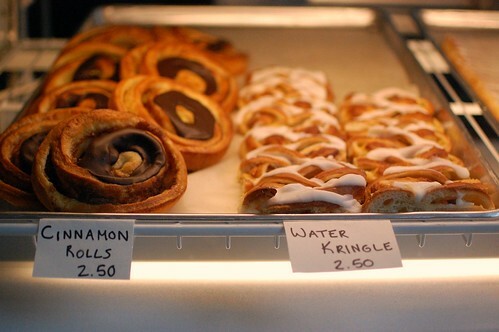 Did you try the Water Kringle? oh this place looks amazing, i need to go! Visions of that tart will stay with me for a while. Everything looks so good! 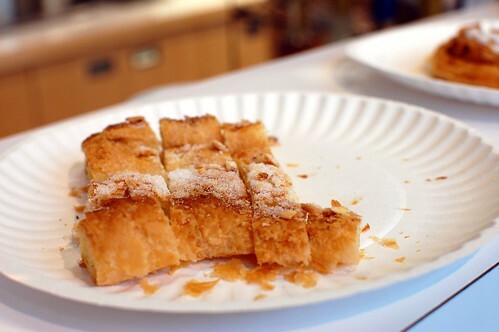 Man im so happy that this is around cause im Danish and miss my bakeries..